Mobile-review.com Review of WCDMA/GSM-handset Nokia E60. Part Two. 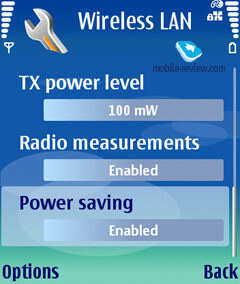 Review of WCDMA/GSM-handset Nokia E60. Part Two. Today we shall continue our review of Nokia E60 smartphone. This is one of the first phones that was developed for corporate clients. Eventually, central development part of such device should be targeted on enterprise applications, such as VoIP, applications targeted for needs of enterprise customers. Before moving on to additional features we shall finish our review of hardware part of this handset. Nokia is traditionally trying not to expose parameters of phone’s components and their manufacturers. Central processor is not an exception. Nokia E60 has Texan Instruments OMAP 1710 processor with maximal frequency of 220 mhz (more information can be acquired here). This processor is installed in many Nokia smartphones. Unfortunately, current synthetic test applications, that measure operation speed of Nokia S60 based devices have not been adapted to 3rd edition of S60. The only thing which can be currently used is test of Java Benchmark, which gives only distant impression of real smartphone’s performance, subjectively proving precense of OMAP 1710 processor. During daily work with this smartphone its performance turns out being fast enough for performing most tasks. Delays during launching applications are present, but they are not that critical and soon you will stop noticing them. Application launch time is not more than 1-2 seconds. If you compare subjective comprehension of operating speed of Nokia E60 and Windows Mobile 5.0 based smartphones, then Windows ones are slightly faster. Although I’d like to state this again, Nokia E60 operation speed is enough for most cases (exclude such operations as playing video in maximal resolution, 3D games, which are not typical tasks for enterprise user). Size of constant available memory during first launch is 64.13mb. This area is used for storing user data, files. Size of available RAM after first system boot is 16mb. Trouble with managing memory (automatic closure of minimized applications) that was described in Nokia N80 review is present here at full strength. OS developers are now working on solving this problem, so there’s a chance that this shortcoming will be fixed in upcoming firmwares of Nokia N80. 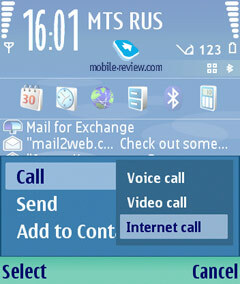 In Nokia E60 we see maximal available set of interfaces. In case you prefer picking on, we can state lack of 4th band for GSM, lack of GPS module, but we shall not do that. Nokia E60 supports maximal amount of interfaces among competitive models. Network standards. Smartphone supports three bands GSM network (900/1800/1900), WCDMA WCDMA 2100 standard. Of course GPRS/EDGE (class B, multi slot class 10) is supported too. There is HSCSD data transfer standard, but it is not that interesting due to slow speed and extremely low availability rate. Theoretic maximal download speed during WCDMA connection is up to 384 kbit/s. IrDA. For some time it seemed that Nokia will fully drop usage of this standard. But at least for Eseries company decided to keep on using this interface, and in our opinion this decision was correct one because of following reasons. First, often IrDA becomes most preferred interface to transfer contacts. Transfer goes on faster, devices should not be bound before (those who have tried bounding several devices and exchange data via Bluetooth will get the idea of which I am talking about). Second, not all business-users are updating their handsets regularly, it sometimes occurs that their handset simply does not support Bluetooth, so you have to use IrDA instead. It turns out that IrDA is present because Bluetooth is currently unable to replace it completely from daily life. 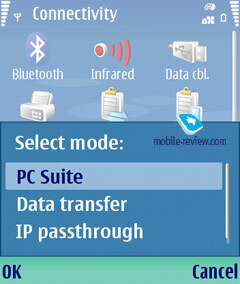 IrDA can be used not only for transferring contacts, calendar entries, but also for receiving and sending files, connecting Nokia E60 as external modem (following standards are supported: IrCOMM, IrOBEX, IrTinyTP). Maximal data transfer speed is – 115 kbit/s. Bluetooth. Modern day handset is hard to imagine to be having no Bluetooth support. Nokia E60 has Bluetooth v1.2 module from Texas Instruments. Following devices profiles are supported: Headset and Hands-Free (connection of Bluetooth-headsets), Dial-Up Networking (usage of smartphone as modem), Object Push (data transfer and reception of objects, such as contacts), OBEX FTP (you can manage files stored on smartphone from your PC), SIM access (remote access to data stored on SIM-card, in order to use this profile you will have to buy additional accessory, such as the new Volkswagen Passat), Basic Imaging (simplified image exchange profile between devices). 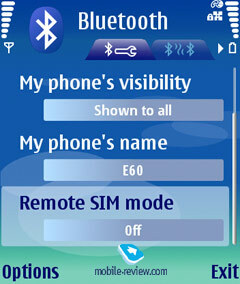 With help of Bluetooth you can synchronize wirelessly smartphone and desktop. We’d like to point out that this smartphone has no A2DP profile support, which allows transferring stereo sound on compatible headphones. Several simultaneous active connections are supported. We had no problems with Bluetooth during our review process. Wi-Fi. WiFi realization looks great on paper, you have IEEE 802.11g security standard support. IEEE 802.11e support is important for applications that are using streaming data, including IP-telephony (automatic energy saving mode, support of QoS). How does it look in reality? Nokia does not have big experience in implementing WiFi into its handsets, and so far it is only starting to gain one. Here is where the result comes from. First, during WiFi usage battery life drains ultimately fast, battery on the whole is a weak part of this device. We are speaking about active mode, when data is transferred. In case you simply turn on WiFi and not use it, battery life will not be affected on the whole. Second, handset heatens up a lot during data transfer. We’d like to point out that there is no UPnP support in Nokia E60, it was made on purpose so that it would not become a cross-feature competitor for Nokia N80. Standard connection for synchronization with Desktop PC. Nothing special about this. Data transfer mode. It’s used for connecting your handset as removable disk drive. It gets recognized as simple flash-drive, during this mode you see only data stored on memory card. We found two shortcomings. First of all, when choosing this mode Nokia E60 switches to off-line mode which is not that convenient. Second, drive is recognized as external drive without need of installing additional drivers, but it takes more than one, two times to actually get the whole thing working. As you can see from table which shows memory card operation speed, memory card operation is not fastest one. It is a lot slower than speed you can get by using USB 2.0 card-reader. On the whole the idea is correct, but its realization is a bit clumsy, we did not catch the reason for turning phone into offline mode. Third and last mode – transit data transfer. This mode allows accessing Internet using cable connection (transit of WLAN connection is unavailable) on desktop PC. This connection can be used for VoIP calls for example, when you are unable to access WiFi network. 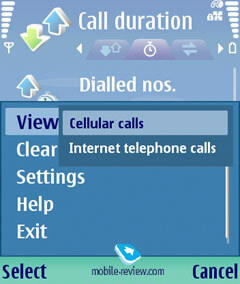 In order to use this feature you will have to install freeware application Nokia Network Bridgde for PC. All attempts that we spent for trying to setup this connection type for Nokia E60 on Windows XP were not successful, meanwhile in case with Nokia 9300i т no problems were encountered (please write us in case you had managed to launch this mode, we will certainly add description of this process to our review). We also wanted to point out organization of APNs. This is relatively new feature for S60 (Nokia N80 for example lacks this feature), but it is present in UIQ 3.0 by default. All created access points (EDGE, Wi-Fi, WCDMA) can be grouped with priority. For example you can create a group of several WLAN-networks (home, work) and EDGE connection. When receiving email smartphone will first try using Wi-Fi connection, and later in case if it was unsuccessful it will use EDGE as connection type. Theoretically in case you specify only group of APNs, smartphone will use most optimal connection at current moment (this was stated in the official User Manual for this handset). In theory this does look attractive, but in reality it turns out being disappointing. In most internal and 3rd party applications APN group cannot be selected. Imagine: you are at home and you check email by using WiFi connection, in order to check email when you are outdoors you will have to change the settings. And in case there are several applications, that are using this process it turns into mockery, I mean switching between connections when moving from one network to another. Alternative mode, which is far from being the best one is selecting APN during every connection. In the end we have a good idea which has been realized only by half. We hope that this shortcoming will be neutralized in future. One of the essentials that each corporate device is ought to show off is support for VoIP-telephony (fast, inexpensive way of communication within a company with better quality, available in rooms with weak cellular signal). And so happens that the cope-stone of the entire Eseries is IP-telephony. Despite SIP being an approved standard and market proposing a whole lot of mutually compatible devices, Nokia guarantees full compatibility with solutions by Cisco Systems and Avaya. These are the brands used for testing out SIP on Eseries phones. The first users of Nokia E60 encountered difficulties with setting up SIP for third-party hardware – back then it was considered that SIP simply wouldn’t work out in pair with third-party solutions. On any attempt to connect the phone crashed without giving reasons or leaving logs. However by trial and error they finally managed to set up SIP protocol and make it work. Below you will find a setup guide found on SIPNET.ru (it’s interesting to know that over at SIPNET they claim that Nokia E60 is incompatible with their hardware base). First of all an established Wi-Fi access point is a must. Once this step is completed, move on to setting up the connection (Tools/Settings/Connection/SIP settings). All core settings are cited on the screenshots below, so that you can make up your own basing upon them. Own access point, seven-unit SIP number, profile name is optional, both UDP and TCP protocols are available for picking. The use settings (Tools/Settings/Connection/Internet tel. settings) to create a profile – choose SIP settings adjusted in course of the previous step. All that is left to do now – is connect (Connectivity/Settings/Connection/Internet tel. Settings/Registration status/pressing on the joystick). If everything is carried out correctly, the phone will establish connection to the network and bring up a new icon in the top right corner, which indicates connection status. In core SIP settings you can now change value of «Registration» to «Always On», so that the phone from that point on will automatically connect to SIP-server while within coverage of a home or work Wi-Fi network. In order to call to a city or mobile number, you need to dial “8” before inputting the number (e.g. 84951234455) at the home screen and them push the left soft-key (Call/Internet Call). Instant internet calls are supported as well, in case VoIP has higher priority than cellular network in the settings. Calling to SIP-powered phones is also enabled – while at home screen, enter desired number as follows: 1234567@servername.com (to start typing letters after numbers, press and hold «#» key). As for the phonebook, to make a call via Internet, you will need to insert «sip:» before a telephone number. 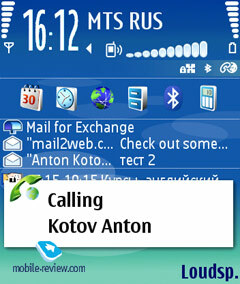 Both incoming and outgoing Internet-calls are displayed on the smartphone’s screen in the same manner as regular ones with the only difference in the form of a globe and lock (open or closed – depends on whether security is on) icons. All Internet-calls are recorded in the call lists along with regular calls – in fact, integration of VoIP service into the phone is considerable, therefore user usually end up with the necessity to press one or two extra keys in order to perform an Internet-call. While the quality of sound appears fairly good, signal delay, as a rule, doesn’t exceed one second. At the time being VoIP-telephony provided by SIPNET attracts not only with free calls to city Moscow and St. Petersburg numbers from any place on the globe, where Internet is available; free calls to cellular phone are also being offered. It comes in handy especially when you are on a business trip and have wireless Internet service on hands, on top of that you are also at liberty to initiate free of charge calls from one cellular phone to another via WAP (it does work, checked) No doubt that free outgoing calls to mobile phone are going to be denied in the near future by at present this proves to be an excellent solution. Now, what regards the shortcomings. Shortly after 15-20 minutes of a call made via VoIP the casing becomes so hot that it stats scorching not only you ear but the palm as well. Thus short pauses, when the E60 should cool down, are inevitable. But there are two possible solutions of this issue – the first one is to talk less, and the latter one requires a headset. However these don’t cancel another problem – should you talk much, be ready to recharge the battery regularly, moreover it may happen that the phone won’t last even a workday. We carried out a simple test – connected a smartphone to SIP via Wi-Fi and to one of the Moscow cellular operators – MTS in the point with the strongest signal level, on top of that Bluetooth was always on. An important note – in course of this experiment the phone was just lying on a table, in other words neither calls nor other actions were performed with it. In this mode the charge on the battery lasted precisely 25 hours. Another flaw is handling of access point groups. In case you are traveling from one Wi-Fi zone to another (for example you came home after work) – be sure you have changed the settings. And the last thing of note is instability of VoIP service, as matter of fact it’s not such a rare occasion for the E60 to crash during a call or refuse to accept an incoming call. Summing everything up, it’s clear the VoIP potential put into the Eseries is enormous, though the implementation still leaves much to be desired. Nonetheless the abovementioned drawbacks can be dealt with, so you can apply Internet-telephony daily even nowadays (actually as I do) and keep recharging the smartphone once a day on average. The next step aimed at integration of Internet-telephony into cellular networks will imply usage of GAP standard (Generic Access Network, previously known as UMA). The point here is to use a unified number (in case of SIP-telephony an additional number is required, thus you have to pay for services of a SIP-provider) for all calls, while the handset will access operator’s core network via both cellular network or an alternative high speed connection, so the phone could switch between them without notifying the user. Later on we are planning on releasing a dedicated article covering extra software for Eseries in order to close this matter and not to return to it in reviews on Nokia E60/Nokia E61/Nokia E70/Nokia E50. The receiving part of Nokia E60 does very well, though it would have been strange to experience something else here. The loudspeaker’s volume is just enough to make sure you won’t miss a call on a street; however in a quiet room the phone with the maximum volume level will be way too much. The advent of Nokia E60 strikes a preventive blow on Windows Mobile lines on the market of corporate devices aimed at RIM market share. Functionality-wise this model is more likely to meet the requirements of a business-user, as it lacks camera, comes in an austere casing and offers a long list of enabled interfaces. The Internet-telephony is deeply integrated into other capabilities of the phone and thus the E60 stands out against the background of the smartphones running Windows Mobile. The bundled office software kit allows Nokia E60 to top smartphones based off Windows Mobile for Smartphone system, which don’t have any apps of this kind on board at present (there are a couple of third-party apps for viewing office documents, however those applications, handing MS Office docs editing have extremely poor interface). And the last but not the least attraction is a wide set of third-party applications for e-mail synchronization (including Active Sync Push-mail) – all this places Nokia Eseries maybe not ahead, but definitely in one row with Windows Mobile as an efficient tool for corporate users. Naturally model Nokia E60 retains a number of shortcomings, the major one of which is mediocre life time, not flawless Wi-Fi and casing heating are also not welcome. All other flaws originate from the installed software and might be fixed with time.